MSNBC host Rachel Maddow recently covered the topic of fracking on her television show. (The video segment is embedded at the bottom of this post.) She framed the issue as a struggle between satisfying our nation's energy demand and maintaining public safety. That might sound reasonable, but what transpired was an unscientific, selective reporting of the facts. She began her segment with that favorite boogeyman of the progressive anti-nuclear left, Three Mile Island, saying, "People began to feel like whatever its potential upside was, it was maybe too dangerous to be worth it to pursue more nuclear power." Yes, that's true, but it's because of people like Rachel Maddow. Three Mile Island was indeed scary, but it was nowhere near the catastrophe the anti-nuclear movement made it out to be. In fact, the natural background radiation posed a bigger threat to the residents than the small amount of radioactive gas that was purposefully vented following the meltdown. Did Maddow remind her viewers of that fact? No. Clearly fearmongering, she went on to explain that powerful images are what cause people to turn against allegedly dangerous sources of energy. She then proceeded to show the now infamous footage of some guy in Colorado lighting his tap water on fire, and of course, she tied these images to natural gas drilling. Did she mention the University of Texas study which concluded that methane in water wells was probably natural and likely was present in the water prior to shale gas operations? No. Maddow then got to the main point of the segment: that fracking causes earthquakes. "Over a span of 40 days, between June and July, north Texas was rocked by an astonishing eleven separate earthquakes," she said, while showing a map overlaying earthquake epicenters with gas drilling sites. But a paper published in PNAS, also from the University of Texas, provided more information. 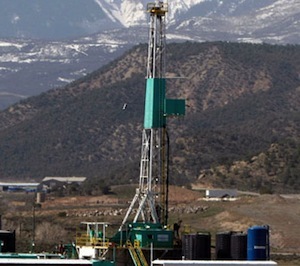 Did fracking cause earthquakes? Yes, probably small ones. Maddow enthusiastically reported this. But, many injection wells (where waste water was injected) did not have any earthquakes at all. The author hypothesizes that earthquakes can only occur if there is a suitable fault nearby. Did Maddow report that? No, of course not. It's worth noting that geothermal energy -- a green energy source endorsed by many environmentalists -- also causes earthquakes. One such project in Basel, Switzerland was shut down because of them. Did Maddow mention that? No. She then brings on a reporter and ironically asks, "Did I leave anything important out?" The reporter amazingly responds, "No, I think you covered it pretty well." He does however, to his credit, correctly assert that not all wells have been associated with earthquakes. Maddow's fracking analysis was nothing more than a biased, one-sided presentation of a serious science policy issue. That is unfortunate because Maddow likes to present herself as scientifically-minded. But presenting only the facts that support your case, instead of all of the facts, isn't what a scientist does -- it's what a partisan does.